nuts (optional) - I didn't add any, but I know how you people like your nuts! Combine dry ingredients in a large bowl. Whisk oil, eggs, and vanilla together in a medium bowl, then add to dry mixture. Stir until just combined, then add carrots and cranberries & stir until incorporated. Divide batter evenly into 12 muffin cups and bake at 350 for 28-30 minutes. These are so yummy! They absolutely accomplished what my body was craving! 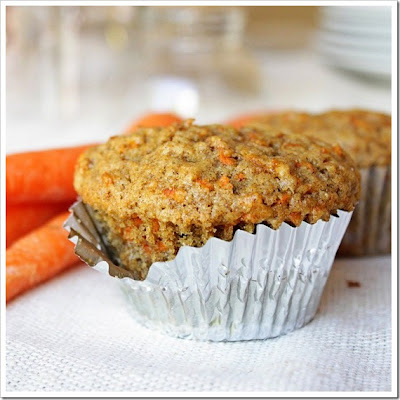 They don't have a strong carrot flavor, the flax makes them a little hearty, the cranberries add some tartness, the applesauce, brown (not white) sugar and whole wheat flour make them healthier than your average morning muffin, and they are EASY! (I will say, that my right arm is going to be uber sore tomorrow from grating the carrots… pathetic, I know.) The hubs wasn't a fan, but he's kinda crazy anyway! Amelie loved them (and I might have eaten 3 right out of the oven).